Even with a pair of two-goal comebacks, the Carolina Curse continues. Teuvo Teräväinen's breakaway goal with 1:35 left in overtime gave the Hurricanes a 6-5 win over the Buffalo Sabres Thursday in KeyBank Center. Teräväinen's unassisted tally, his second of the game, saw him deke Linus Ullmark to the ice as he broke in alone after Jack Eichel's shot went high and wide. In a game that saw Buffalo rally from 2-0 and 5-3 deficits, Carolina posted its eighth straight victory over Buffalo and pulled one point ahead of the Sabres in the Eastern Conference. The Sabres fell to 1-1-1 on their seven-game homestand and failed to win two straight games for the seventh straight time since their last multi-win run in mid-December. The Sabres had forced OT on Jeff Skinner's goal with 55.4 seconds left in regulation, his 33rd of the season and second of the game. He has three goals in two games this year against his old team. A wild third: Both teams scored three times in the final 20 minutes. It was tied at 2-2 through two periods before the Hurricanes broke on top at 1:54 on Greg McKegg's tap-in. But Buffalo rallied to make it 3-3 on Skinner's 32nd of the year, a backhand at 5:48. Canes grab control: Brock McGinn's tap-in put the Canes ahead, 4-3, with 8:57 left and Carolina seemingly took a stranglehold with 5:15 left on Nino Niederreiter's tally, which came 13 seconds after a Skinner slashing penalty. Slow start I: The Canes broke on top at 4:04 of the first period as defenseman Justin Faulk found plenty of open ice in the middle of the offensive zone and slammed home a pass from Sebastian Aho. Slow start II: Carolina pushed the lead to 2-0 at 1:23 of the second period as Teräväinen just nudged past Casey Mittelstadt to sweep home a backhand after Jordan Martinook beat Marco Scandella to a loose puck and fired it off the crossbar. 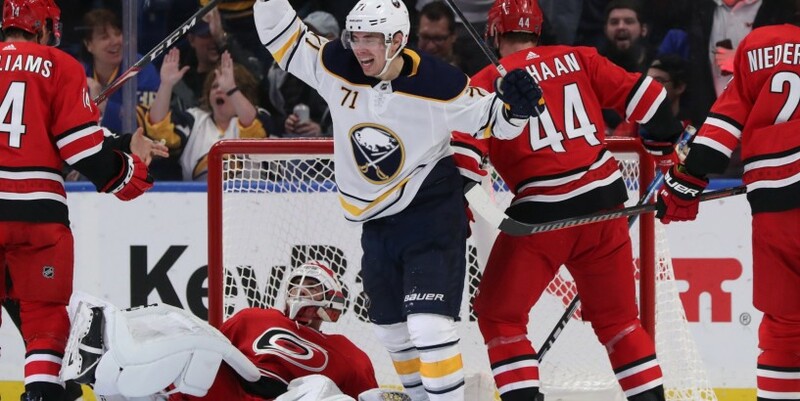 Climbing back : Carolina goalie Curtis McElhinney was coming off a shutout Tuesday in Pittsburgh and stopped the first 23 shots he faced against the Sabres before Buffalo finally broke through on an Evan Rodrigues goal at 8:15 of the second. The score came two seconds after a power play expired and saw Rodrigues exercise patience, holding the puck for an extra second to find some daylight to shoot at. E-Rod power: Rodrigues' goal was his career-high eighth of the season, and his sixth in the last eight games after he scored just twice through his first 39 games of the season. Rodrigues has seven points in those eight games. Getting even: Jason Pominville forged a 2-2 tie at 15:14 of the second, driving home his own rebound for his 12th goal of the year. It moved the 36-year-old Pominville into sole possession of eighth place in franchise history with 512 points, one ahead of former captain Mike Foligno. Pominville has 213 goals and 299 assists. The lineup: The Sabres made changes on defense, ending their one-game experiment that paired Rasmus Dahlin and Rasmus Ristolainen. Lawrence Pilut went back with Ristolainen while Dahlin played with Zach Bogosian, who appeared in his 600th NHL game. The third pair was Jake McCabe with Marco Scandella. Up front, Johan Larsson returned after missing two games with an upper-body injury. Counting the house: The Sabres announced they sold 17,588 tickets for the game. Up Next: The Sabres are scheduled to practice Friday in HarborCenter before hosting a rare back-to-back of weekend matinees. The Detroit Red Wings are here for a game Saturday at 1 and the Winnipeg Jets closely follow into town for another game Sunday at 3.